For the first time this century a seasonal ice cover was observed at the summit. The ice cover was seen on the N and W faces from February 1993 through the end of May. 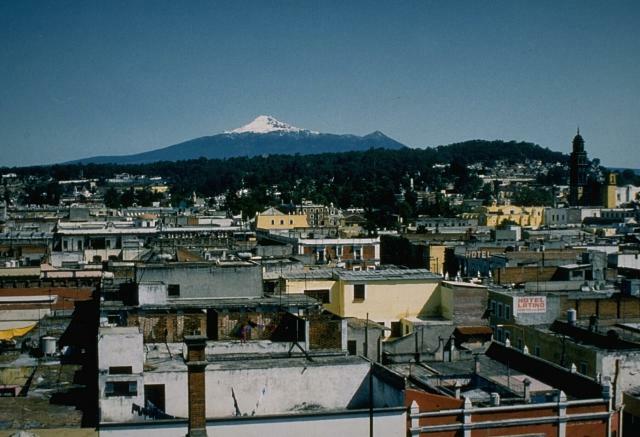 The primary source of water for Puebla is runoff from Malinche; it is not known what effect the development of an ice cap will have on the water supply. Glacial deposits have been identified on the NE flanks of the volcano. Seismicity has been monitored daily from a station at Puebla University since 1986, but no events have been detected. Reference. von Erfa, A., 1979, Geología de la Cuenca Puebla Tlaxcala: Comunicaciones No. 5, Fundación Alemana para la Investigación Científica. Information Contacts: Alejandro Rivera Dominguez, Dept de Ciencias de la Tierra, Univ Autonoma de Puebla, Apartado 1572, C.P. 7200, Puebla, México. The Global Volcanism Program has no Weekly Reports available for La Malinche. La Malinche is an eroded stratovolcano, cut by deep canyons, that rises to 4461 m NE of the city of Puebla. Malinche occupies an isolated position between the Popocatépetl-Iztaccíhuatl and Orizaba-Cofre de Perote volcanic ranges. 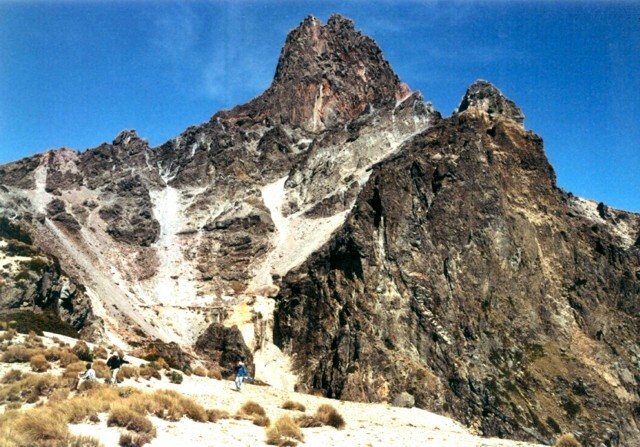 Much of the andesitic-dacitic volcano was constructed during the Pleistocene, and the summit exhibits evidence of glacial erosion. This volcano remains relatively unstudied, however, recent work has identified tephra layers of Holocene age that originated from Volcán la Malinche. Several tuff cones and explosion craters, at least one of Holocene age, are found on the flanks of the volcano; one of the most prominent of these is the Xalapaxco tuff cone complex on the lower NE flank. 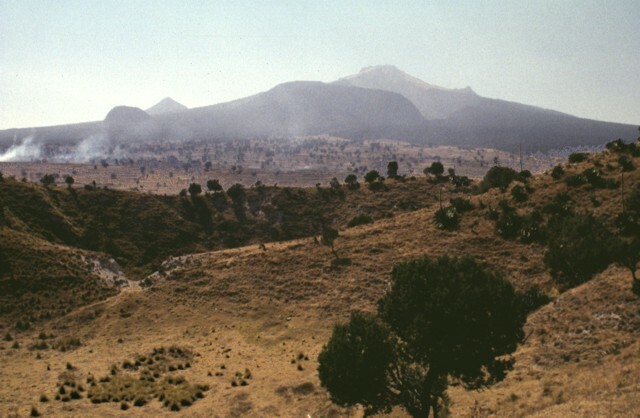 Holocene lahars from La Malinche associated with an eruption about 3100 years ago reached the Puebla basin and affected precolumbian settlements. Castro-Govea R, Siebe C, 2007. Late Pleistocene-Holocene stratigraphy and radiocarbon dating of La Malinche volcano, central Mexico. J. Volcanol. Geotherm. Res., 162: 20-42. Macias J L, 2002. (pers. comm.). Nelson S A, 1990. Volcanic hazards in Mexico--a summary. Univ Nac Auton Mexico Inst Geol, Rev, 9: 71-81. There is no Deformation History data available for La Malinche. There is no Emissions History data available for La Malinche. The snow-capped summit of Malinche volcano rises to 4461 m NE of the historical city of Puebla. Pleistocene glaciers have excavated the flanks of the volcano, but deposits of Holocene eruptions have recently been dated. Several tuff cones and explosion craters are found on the flanks of Malinche, at least one of Holocene age. Photo by Ismael Morales, 1993 (Universidad Autónoma de Puebla). 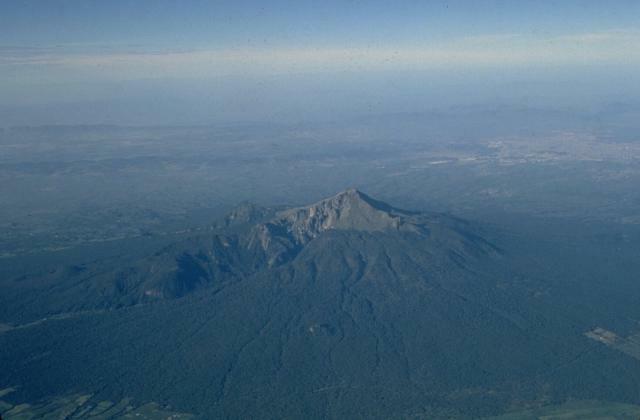 Volcán la Malinche, seen here from the south, derives its name from a Mayan woman who became the wife, aide, and interpreter of the Spanish explorer Cortés. The Spanish mispronounced the woman's name Malintzin as Malinche. Legends have surrounded Malinche, who is also referred to as La Llorana (the weeping woman) and whose ghost is said to be seen at night weeping over the betrayal of her race. Photo by Steve Nelson, 1987 (Tulane University). 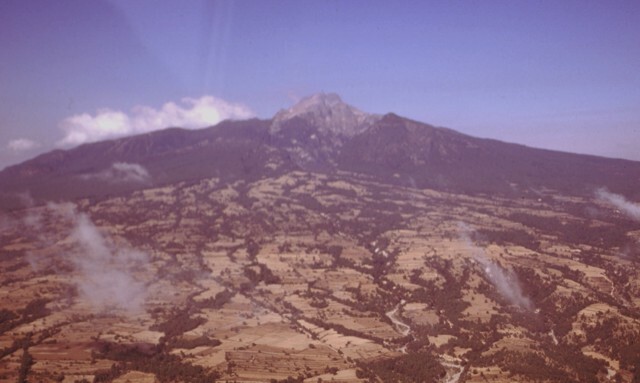 Volcán la Malinche, seen here in an aerial view from the NE, is an eroded stratovolcano, cut by deep canyons, that rises to 4461 m NE of the city of Puebla. Malinche occupies an isolated position between the Popocatépetl-Iztaccíhuatl and Orizaba-Cofre de Perote volcanic ranges. Much of the andesitic-dacitic volcano was constructed during the Pleistocene and the summit exhibits evidence of glacial erosion, but recent work has identified tephra layers of Holocene age that originated from Malinche. The NE flank of Volcán la Malinche is cut by deep glacially carved canyons. The craters in the foreground are part of the Xalapaxco tuff cone complex. Xalapaxco means "vessel or container made of sand" in the Aztec Nahuatl language. The tuff cone contains ten overlapping craters formed by changes in water and magma supply rates during the course of an eruption. The tuff cone was erupted through alluvial fan deposits consisting of reworked fluvial and glacial deposits on the lower flank of Malinche. Broad alluvial fans composed of fluvial, glacial, and volcaniclastic sediments surround La Malinche volcano. The circular volcano is dissected by radial drainages on all sides. Relatively few volcanological studies have been conducted on Malinche and most studies have had a geomorphological and glacial focus. 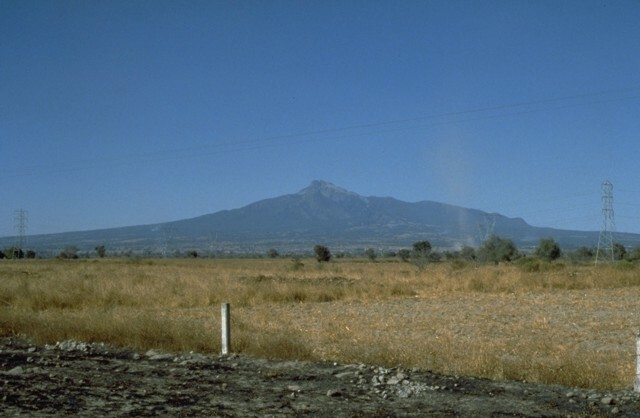 During attempts to reconstruct the Quaternary glacial history of Mexican volcanoes a yellowish-red pumice layer that extends around Malinche volcano was dated at between about 12,100 and 7650 years ago. Malinche is the most prominent volcano between the Popocatépetl-Iztaccíhuatl and Orizaba-Cofre de Perote volcanic ranges. Much of the andesitic-dacitic volcano, seen here in an aerial view from the SE, was constructed during the Pleistocene. Deep glacially carved canyons dissect the flanks of the 4461-m-high volcano. Holocene lahars from La Malinche associated with an eruption about 3100 years ago reached the Puebla basin and affected precolumbian settlements. The rugged summit pinnacle of La Malinche volcano is seen here from the south. 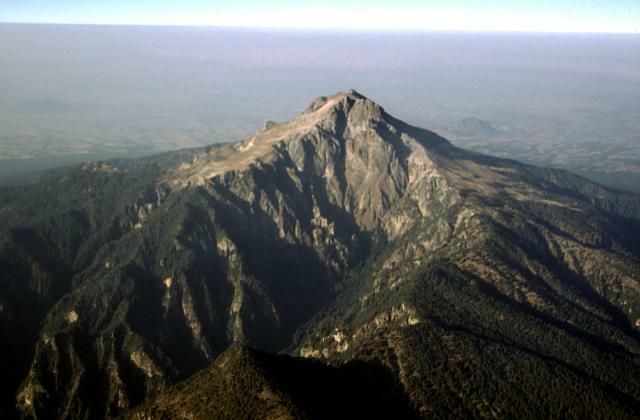 The summit of La Malinche consists of several lava domes, one of which filled the vent from the last major eruption of the volcano about 3100 years ago. Note the people in the left foreground for scale. Photo by Renato Castro, 2000 (courtesy of José Macías, Universidad Nacional Autónoma de México). 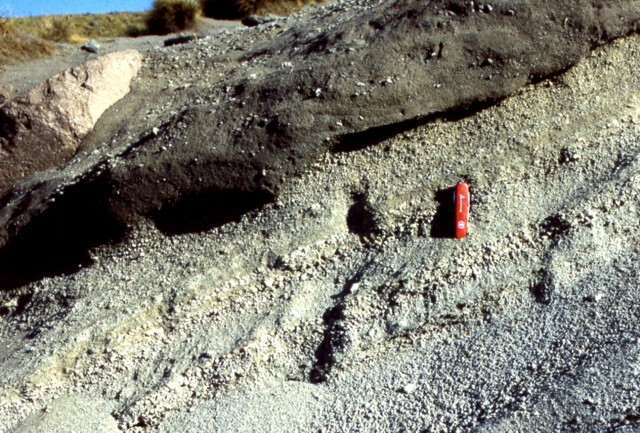 The products of the last major eruption of La Malinche, which occurred about 3100 years ago, are exposed around the summit area and consist of a weakly stratified pumiceous ash and fine lapilli layer, along with associated ashflow and lahar deposits. Lahars originating from La Malinche reached the Puebla basin and contain pottery fragments, indicating that precolumbian settlements were affected by the eruption. Pocket knife provides scale. 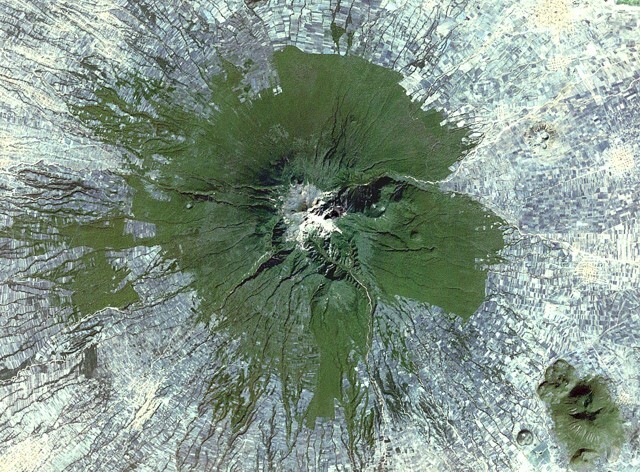 Farmlands encroach on the radially dissected slopes of La Malinche volcano in this 1999 satellite image. Deep canyons cut the flanks of this solitary stratovolcano NE of the city of Puebla. The late-Pleistocene Xalapaxco maar complex forms the small circular area in farmlands on the lower ENE flank. There are no samples for La Malinche in the Smithsonian's NMNH Department of Mineral Sciences Rock and Ore collection. Large Eruptions of La Malinche Information about large Quaternary eruptions (VEI >= 4) is cataloged in the Large Magnitude Explosive Volcanic Eruptions (LaMEVE) database of the Volcano Global Risk Identification and Analysis Project (VOGRIPA).